The pilot container train en route Ukraine - Georgia - Azerbaijan - Kazakhstan - China (through the Caspian and Black Seas) will leave the Ukrainian port of Illichivsk on January 15, the press service of the Infrastructure Ministry reported. "This route is a new "Silk Road" direction and an alternative enabling us to divert traffic flows in eastern direction bypassing the Russian territory. It includes ferries through the Black and the Caspian Seas (Illichivsk - Batumi and Aliat - Aktau Port) and should become a competitive route in comparison with the traditional overland route," a statement reads. The ministry noted that the description of the project possibilities of the Trans-Caspian international transport route was presented to potential consignors during a roadshow on November 16, 2015 and during the International Forum "Bridging Europe and Asia: a new look at formation of the transcontinental routes" (Odesa) on December 3, 2015. 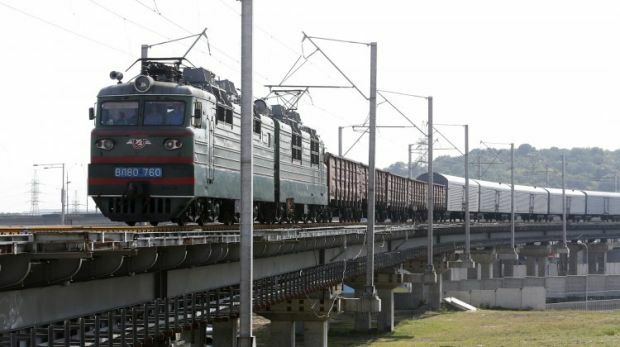 Read alsoRussia bans all transit of Ukrainian goods"There have been reached agreements as for technology, faster delivery, tariff conditions and specific train operators prior to the launch of the container train. The pilot container train will open an alternative route for delivering goods from Ukraine to Central Asian countries. The container train will consist of approximately 20 rail cars," the ministry said. It is also noted that against the background of the termination of transit of Ukrainian goods through the Russian territory, the Infrastructure Ministry jointly with the Ukrainian Railways will continue working on the creation of alternative routes to divert cargo flows in eastern direction. As UNIAN reported earlier, the Trans-Caucasus-Asia transport corridor "New Silk Road" was launched bypassing Russia. In particular, on December 13, China sent the first transit container train to Georgia through the so-called "New Silk Road."